To win gold medals at a competition judged by fellow winemakers is an honor, but to be recognized as “Winery of the Year” for the Eastern United States sets a precedent not only as a quality winery, but as a premium example of a noteworthy wine region. 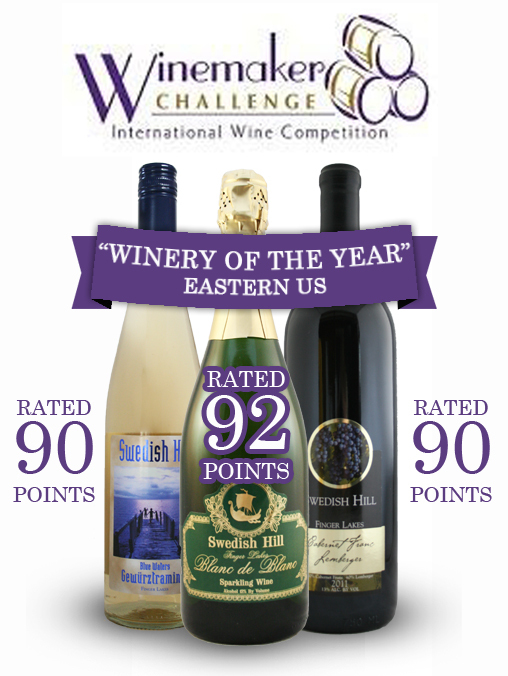 Swedish Hill Winery is thrilled to announce this accolade along with seven medals from the Winemaker Challenge International Wine Competition. Held in San Diego, California, this competition had a record breaking year with 939 entries from 10 countries. For the first time in its six years the judges, 19 winemakers, also awarded points to all of the medal winning wines. The gold medalists for Swedish Hill include the 2013 Blue Waters Gewürztraminer (90 points), the 2012 Cabernet Franc Lemberger (90 points) not yet released, and as noted by the competition’s director, Robert Whitley, the ” impressive non-vintage sparkling Blanc de Blanc” (92 points). The four wines awarded with silver medals were sparkling Naturel (87 points), 2013 Riesling (88 points), 2012 Cabernet Franc (88 points) not yet released, and the 2013 Vidal Blanc (89 points). This is the fourth year in a row that Swedish Hill has been named “Winery of the Year” from esteemed wine competitions. In 2012 Swedish Hill was honored at the Riverside International in California, then in both 2013 and 2014 it was acknowledged at the New York State Fair Commercial Wine Competitions. These titles serve as an attestation that Swedish Hill consistently produces exceptional wines, year after year. To see a complete list of Swedish Hill’s accolades, click here.